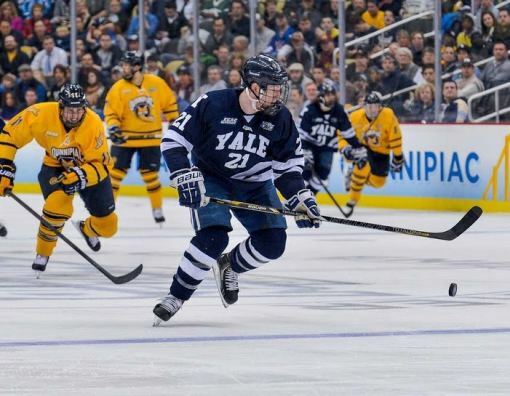 By all accounts, the Yale hockey team should not have been in the NCAA tournament this spring, much less in the championship game of the Frozen Four. To say they were a longshot is putting it mildly. Dueck, who has been involved with Athletes in Action since his first semester at Yale, says he felt the two losses at the league tourney had all but sealed the Bulldogs’ fate: There would be no national tourney appearance in this, his senior year. The teams had been good over the years, but not good enough to make it to the big dance. But as the bracket began to fill up, Yale found itself with the last at-large bid into the tournament, earned more on another team’s loss than their own record. It was all uphill from there. At the championship game in Pittsburgh, Yale faced conference foe and nearby neighbor Quinnipiac, who came into the national tourney at No. 1 overall and had already knocked out the Bulldogs three times that season…handily. But as the last buzzer sounded, it was Yale on top 4-0, skating away with their first national title. On the advice of AIA staff member Craig Luekens, who serves at Yale, Dueck took time to pray and dedicate that time to God, no matter the outcome. He found a quiet calm amid the storm in the Bible. After the confetti had settled, Dueck again sought Luekens’ advice on what the godly reaction should be to the hype surrounding the national championships. While the player wanted to be humble and play down the achievement, Luekens had different ideas. That shift in thinking has come on the heels of four years in the AIA ministry at Yale, something Dueck claims was just what he needed in the harried world of college sports and Ivy League academics. Looking back now as he graduates with a psychology degree and pursues hockey at the next level, Dueck can see how God orchestrated that involvement from before he even stepped foot on campus. He recalls a letter from someone at Yale who had seen his profile information about being a church member. Scrawled on the bottom of the standard typed form, the employee had suggested Dueck check out AIA when he got to campus. Within the first few days of freshman orientation, he and his new roommate, Mark, also a believer and a football player, visited the AIA table at an extracurricular fair and met Luekens and other athletes. In his tenure, Dueck says he has seen AIA grow exponentially, both in numbers and in impact, and he’s personally benefited from the fellowship and guidance of older students along the way. At the end of his freshman year, Dueck joined the student leadership team and has led Bible studies as well. All this was encouragement for the Canadian who came in with a strong faith learned from Christian parents and who hoped he would find a fellowship with other believers. He found it easier to avoid the typical college temptations by simply immersing himself in a group of friends who followed Christ.